I’m currently going back through and taking better photos of some of my original crochet patterns. It’s kind of slow going since I actually have to go through and remake each item, but I’m enjoying the process. 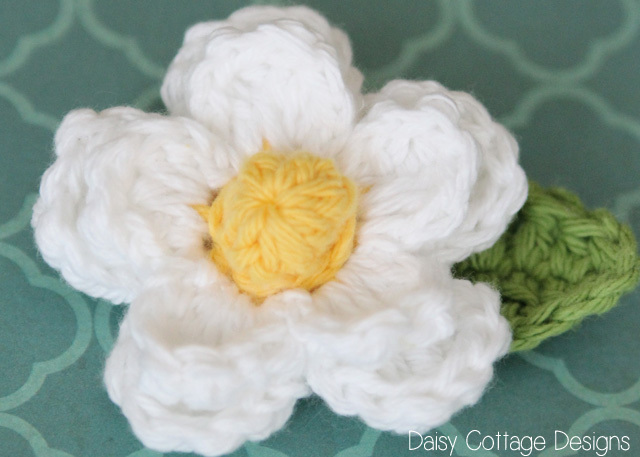 The original photo and pattern for this adorable daisy can be found here. I’ve added a bobble center and a cute little leaf, but other than that, the pattern is the same. And let’s just all agree that my photography has improved at least a little bit through the years. 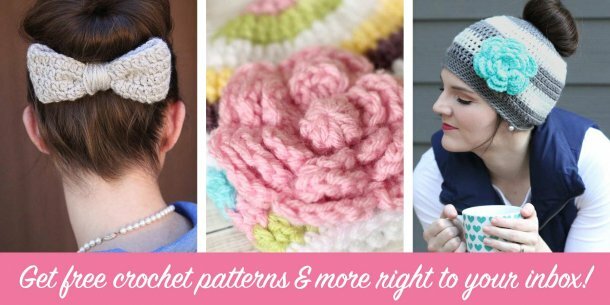 This crochet flower pattern is great for embellishing hats, headbands, bags, and more. Make it in a vast array of colors, or stick with the traditional yellow and white. Either way, you’re sure to create a beautiful appliqué that some little lady will enjoy sporting this spring. 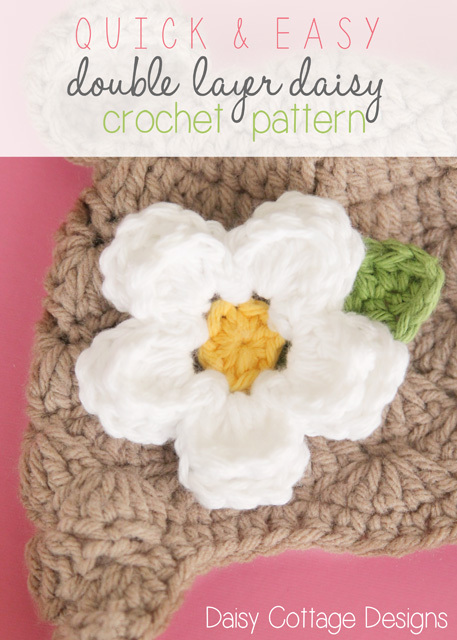 If you want to make your own daisy crochet flower pattern, here’s what you’ll need. 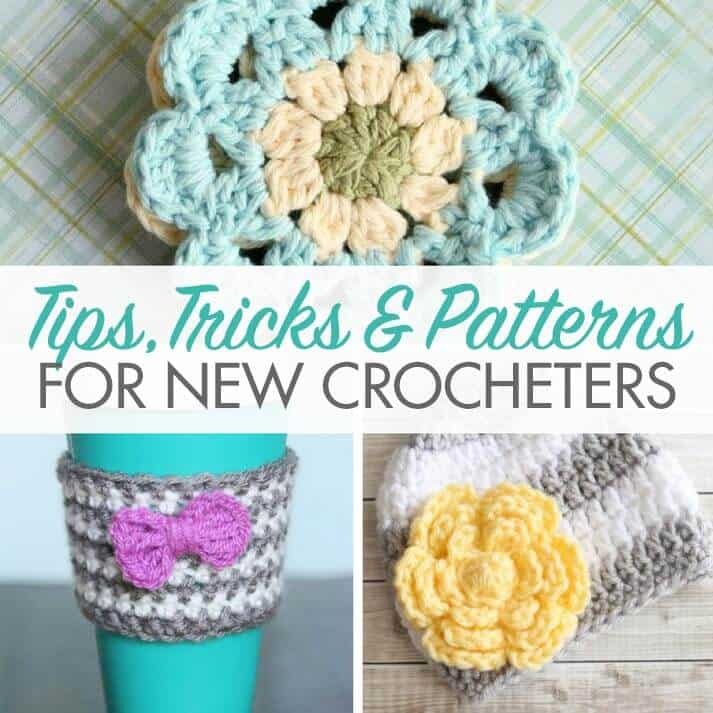 If you’re unfamiliar with back post stitches, check out this tutorial. Let me just make a suggestion: before you get scared reading about back post stitches, pull out a hook and some yarn and just give it a try. It really is easier than it reads! Round 1: Work 10 sc into the second ch from hook. Sl st in the top of the first sc. (Change color after this round if you’d like a different color center). Gently pull tail to tighten. Round 3: ch 1, hdc, dc, 2 tr, dc, hdc, sl st in the same ch 2 space. *ch 1, hdac, dc, 2 tr, dc, hdc, sl st* in each remaining ch 2 space. You will have 5 petals when you finish this round. Round 5: *sl st, ch 1, hdc, dc 3 tr, dc, hdc, sl st* in each ch 3 space. You should now have a second row of petals behind the first. 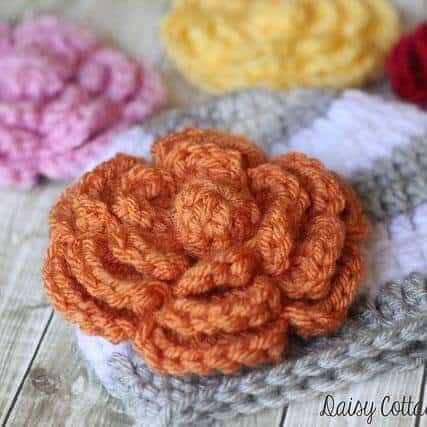 See the second photo to see what the daisy looks like without the bobble. I stuff the other tail into the bobble to keep it puffy. 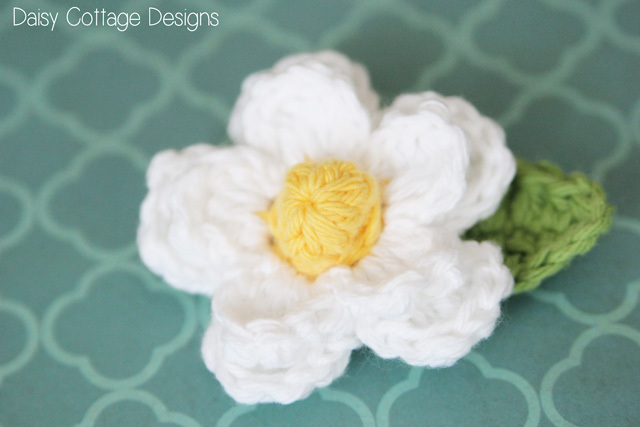 Sew the bobble onto the flower, cut yarn and weave ends. Round 1: sc in the second st, hdc in the next, dc in the next 4 stitches, hdc in the next, sc in the next. 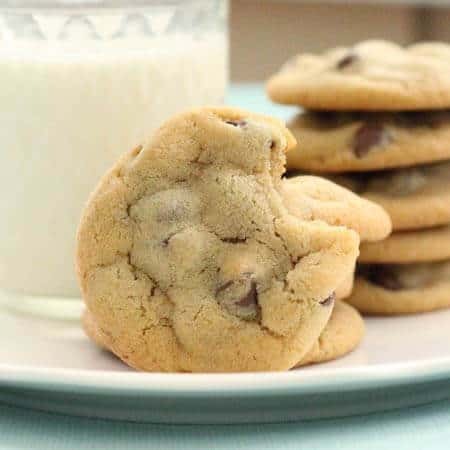 ch 2. Round 2: You aren’t going to turn your work like you normally would; instead, you’re going to be working into the other side of the leaf. sc in the first stitch, hdc in the next, dc in the next 4 stitches, hdc in the next, sc in the next, sl st in the first sc. Leave a long tail to attach to your flower. Using your tapestry needle, sew your leaf to the carnation. Cut yarns and weave ends. 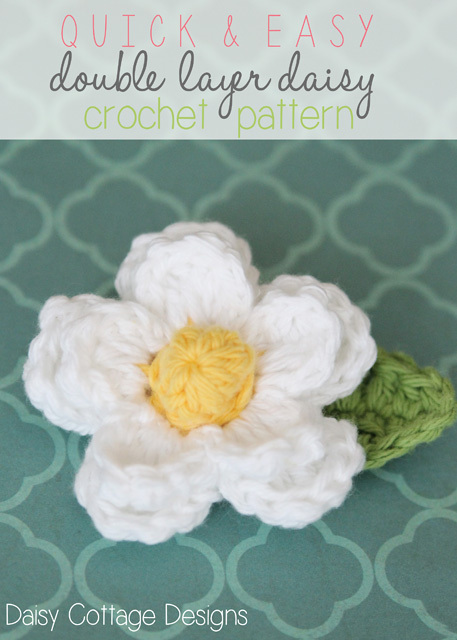 If you decide to make one of these flowers using the daisy crochet flower pattern, I’d love to see it. Use the hashtag #daisycottagedesigns on Instagram or Facebook. Very cute ! 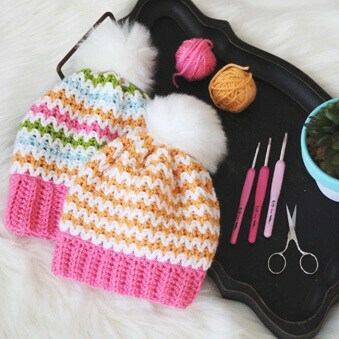 Thanks so much for the pattern ! Hello i love your flower but in the round 4 i am lost because i do not know where to put the hock. I make the the Bpst and the 3 chains and then it is so far the next petal. Thank you for your help. I LOVE this daisey! I’ve been looking for days for the perfect daisey! 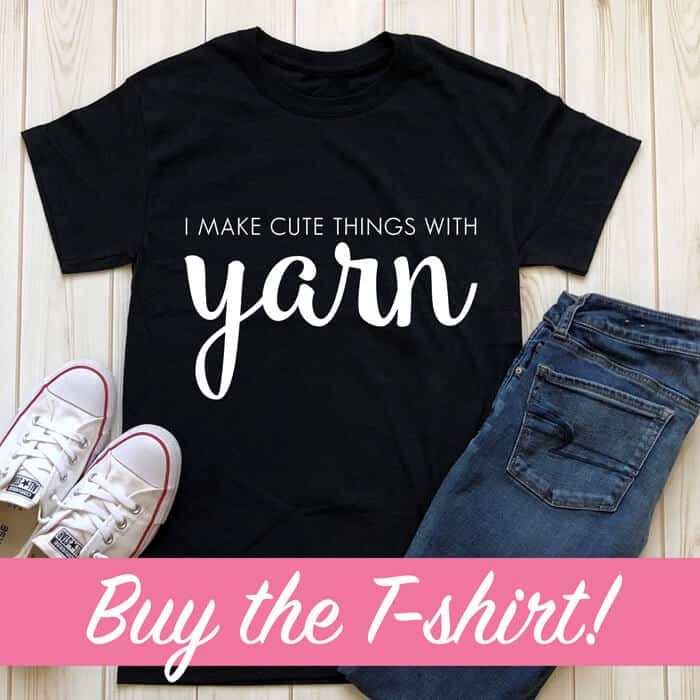 I’m working on a project for my daughter and I may post the pattern online for free use. Would you mind if I mentioned your pattern in it? Of course I would link them back to your page to find the pattern. Just let me know. That’s fine, Chrystal! I appreciate any links back to my site. And you’re welcome to use one image, too! So cute!! Is there a pattern for the hat too? 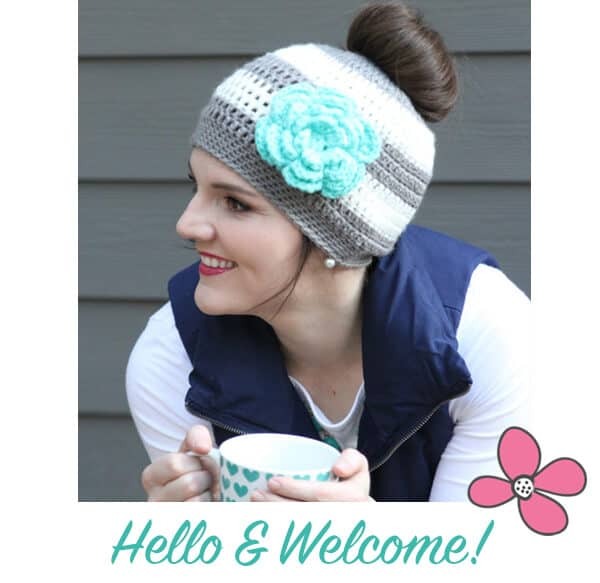 The hat pattern is from Blue J Crochet on Etsy.